Programme du 4e jour à Rennes. Jeudi matin nous aurons les séries du 50 brasse messieurs, du 50 brasse dames, du 50 dos messieurs, du 200 nage libre dames, et du 200 papillon messieurs. Regardez les interviews du quatrième jour des Championnats de France 2018 à Saint-Raphaël. Suivez les interviews de la 2ème journée des Championnats de France 2018 à Saint-Raphaël. French distance swimmer David Aubry broke the meet record in the 800 free and moved up to 5th in the world for the season with 7:50.09. Mathilde Cini a brisé le record des championnats de France dans le 100 dos et a décroché un billet pour Glasgow. After four days of competition at French Elite National Championships in Saint-Raphaël, the list of qualifiers for 2018 European Championships in Glasgow now includes 21 athletes. Béryl Gastaldello’s French National Record in the 50 back was among the highlights of the second day of competition at French Nationals in Saint-Raphaël. The French Elite National Championships begin tomorrow in Saint Raphael, France. 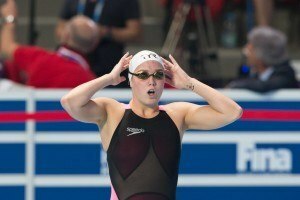 Nice’s Charlotte Bonnet wrapped up the 2018 FFN Golden Tour Camille Muffat – Marseille with a new French National Record in the 100 free, going 53.36 to win the final event of the weekend. Toute cette saison, Charlotte Bonnet est la seule à nager les minima le matin. Mehdy Metella posted the 16th-fastest 100 free time of the season so far, going 48.76 to win in Marseille. Melanie Henique of Marseille won the women’s 50 fly with 25.63, tying her own French National Record and posting the #4 time in the world so far this season. Mathilde Cini is the top seed in the women’s 50 back and 100 back at the Marseille stage of the FFN Golden Tour Camille-Muffat. Jérémy Stravius of Amiens won the 100 fly (53.04) and the 50 free (22.87) on the third and final day of competition in Sarcelles. Marco Koch of Germany won a largely uncontested 200 breast. 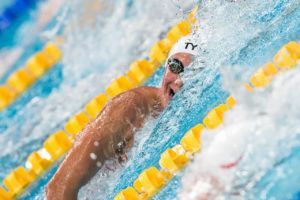 Denmark’s Pernille Blum will be among those racing at the “Meeting FFN Golden Tour Camille-Muffat Étape 2” at the Centre Aquatique Christiane et Guy Canzano in Sarcelles this weekend.